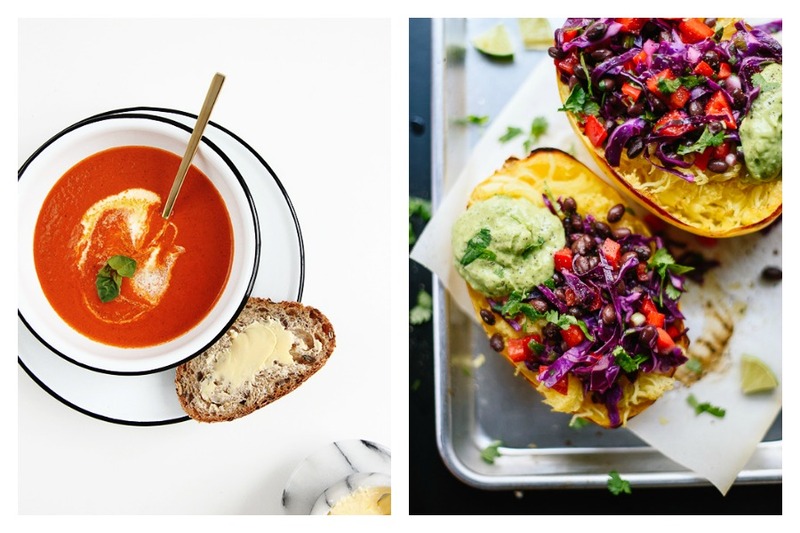 Cool Mom Eats weekly meal plan: 5 easy dinners for the week ahead. 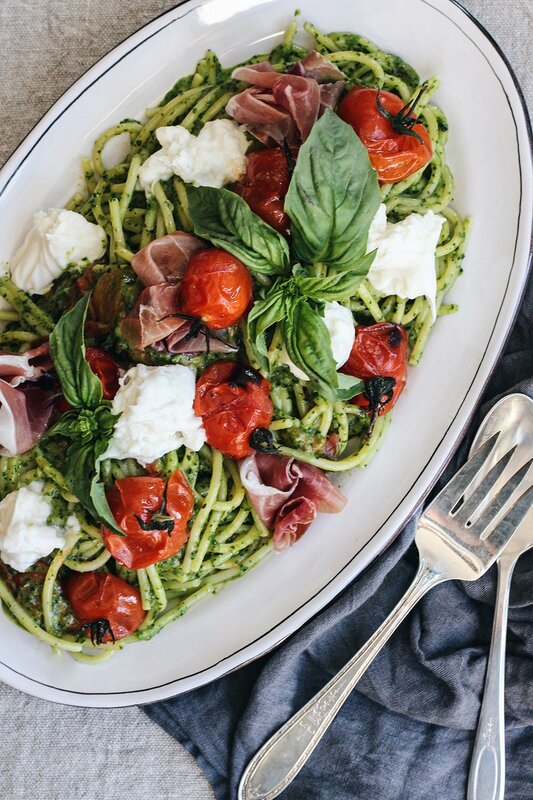 Next week’s meal plan: 5 easy recipes for the week ahead, from a Caprese Pasta with Burrata to a 30-minute salmon for right now. It’s time to start thinking about your meal plan for next week. From a Caprese Pasta with Burrata to a 30-minute salmon for this very moment in the season, we’ve got five dinners that will get you through the busy week ahead. So grab a pen, make your shopping list, and stock up before the weekend’s over. And if it’s easier for you to do that from your inbox, be sure to sign up for our weekly meal plan emails. Related: Avoid the oven with these 6 summer slow cooker and Instant Pot recipes. 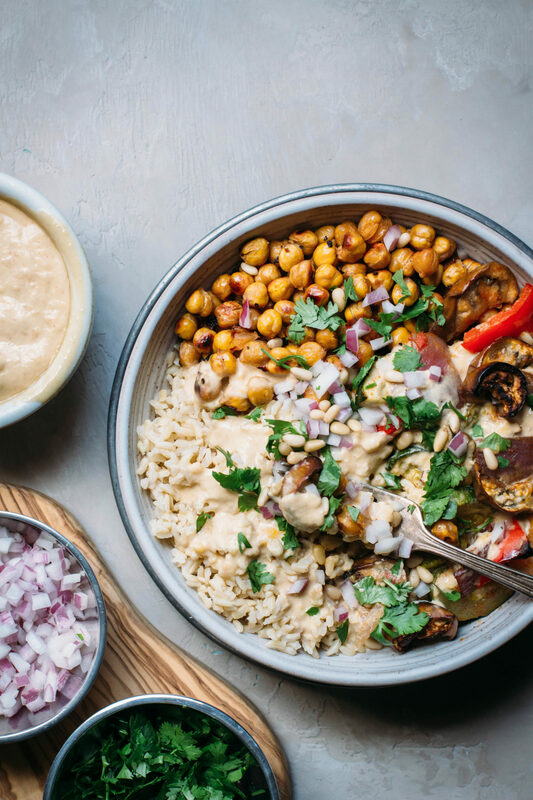 I don’t know about you, but the quickest way to get my kids to say yes to a big bowl of roasted veggies is to serve it doused in mango tahini like in this gorgeous Moroccan Spiced Vegetable and Chickpea Bowl with Mango Tahini Sauce at Simple Natural Nutrition. I also love that you can easily make extra of nearly every element of this perfect #MeatlessMonday meal — the sauce, the veggies, the rice — to have on hand for other meals or packed lunches the rest of the week. 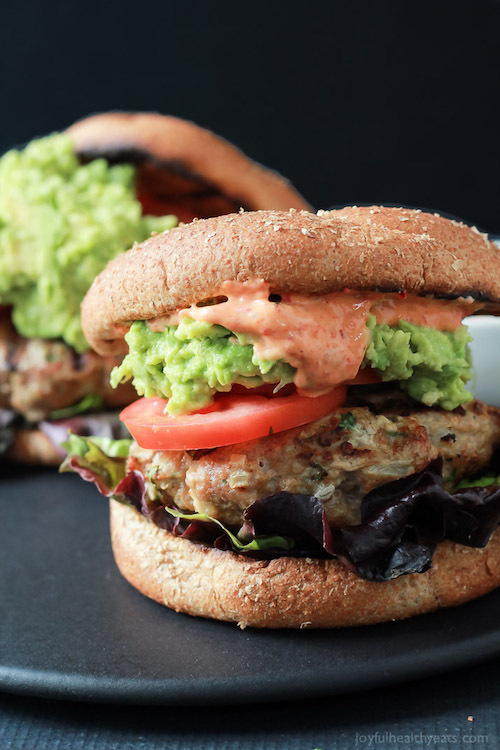 Summertime means adding burgers to regular meal plan rotation, and this week I’ve got my eye on the Southwestern Turkey Burgers from Joyful Healthy Eats that Jane found to demonstrate one of the six expert tips she got on how to grill perfect burgers. Jane gives a great shortcut on how to make the spiced aioli and you can also pick up store-bought guac to make these even faster. I promise they’ll still be delicious. 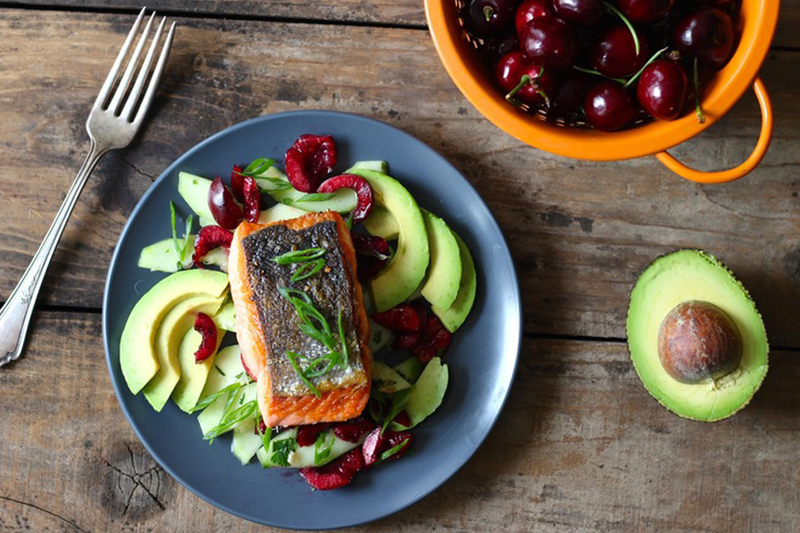 The cherries in my supermarket are beautiful right now and they won’t last long, so you can bet that I’m all over every single one of these easy cherry recipes that I found for every meal of the day. Yes, including dessert. 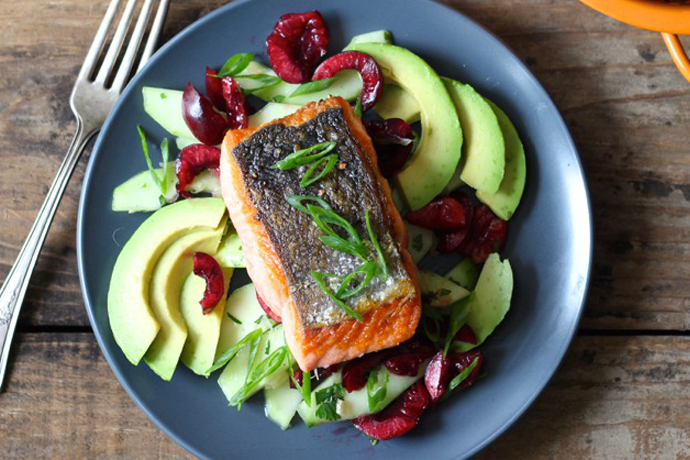 But for dinner, it’s all about the amazing Salmon with Cucumber, Cherries, and Avocado at Borrowed Salt. Light, fresh, and full of flavor, this recipe is a regular for me every time this time of year rolls around. Related: 6 clever ways a store-bought roasted chicken makes vacation meals easy. Pasta can be too much in the summer, but when done correctly — like this Caprese Pasta with Roasted Tomatoes and Burrata at Honestly Yum — well then, pasta can be just right. I love roasting cherry tomatoes on a Sunday to have on hand for various uses during the week, and this is a perfect way to use some up. Also, if you’d rather keep this vegetarian, just skip the prosciutto. Easy peasy. 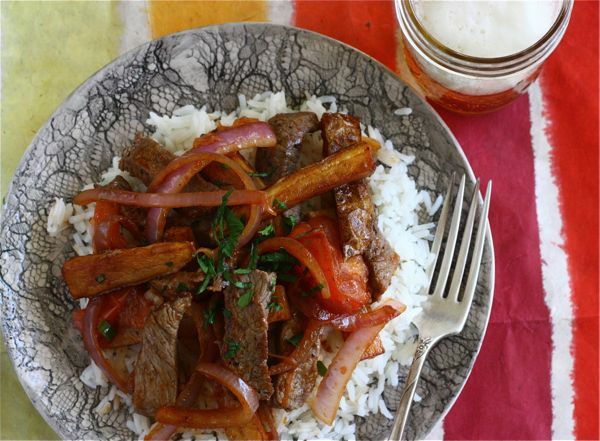 I’ve been dying to make this Lomo Saltdado (Peruvian Stir Fry) at A Cozy Kitchen for a very long time. If you follow Adrianna, you can probably tell from the photo alone that this is from an old post (2012, to be exact). It’s for a recipe from her childhood and, to be honest, it has one very annoying step. She offers a shortcut that sounds delicious, but it isn’t one that I’d ever use. I recently discovered the joys of these Alexia Yukon Gold French Fries, though, and they’ll do the job perfectly, so this recipe is finally on my meal plan. I think it should be on yours too.